House Democrats are preparing to propose an increase in the corporate tax rate in their fiscal 2020 budget resolution, a policy that could raise revenue and chip away at the deficit but restrict economic growth and corporate investment. “I think we have to assume somewhat” of an increase in the corporate tax rate, House Budget Committee Chairman John Yarmuth (D-Ky.) said after a hearing Tuesday on the country’s economic outlook. Yarmuth’s panel is tasked with developing a big-picture blueprint for federal spending, a framework that helps appropriators draft the annual spending bills. Because a budget resolution doesn’t have the force of law, it sometimes serves as an aspirational document. The House and Senate may struggle to agree to a final budget resolution, but Yarmuth has said he’s promised to finish work on the House measure by the first half of April. Ranking Member Steve Womack (R-Ark.) said during the hearing he expects Democrats to assume a 28 percent corporate tax rate, an increase from the current level of 21 percent. But Yarmuth said no decision has been made, and he’ll have discussions with House Ways and Means Chairman Richard Neal (D-Mass.). Raising the corporate tax rate could “lower levels of investment, lower capital stock, GDP might take a hit, and wage growth” might fall, Congressional Budget Office Director Keith Hall said at the hearing, though he stressed the outcomes would depend on the details of the policy. 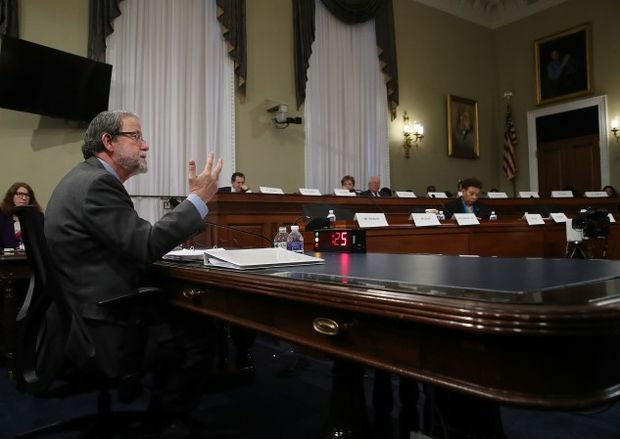 Congressional Budget Office Director Keith Hall testifies during a House Budget Committee on Jan. 29. Democrats criticized Republicans at the hearing for the fiscal effects of the Republican tax overhaul (Public Law 115-97) passed in December 2017, which cut the corporate tax rate from 35 percent to 21 percent. The law is projected to increase the debt by $1.9 trillion, even accounting for about $400 billion in positive economic effects, Hall said. Yarmuth accused Republicans of slashing revenue with no regard for the deficit, saying their plan is to cut funding for Social Security, Medicare and Medicaid. “The state of our union is unsustainable,” Yarmuth said, noting that President Donald Trump’s State of the Union address was originally scheduled for Tuesday, before being delayed by a week because of the partial government shutdown. The federal deficit is $897 billion, or 4.2 percent of the country’s gross domestic product, in fiscal 2019, according to the CBO’s outlook released yesterday. Debt held by the public is slightly more than $16.6 trillion, or 78.3 percent of the GDP. If Congress doesn’t act to either raise revenue, cut spending or do both, it will eventually take “really draconian measures” to address the federal debt, Hall said. While declining to offer policy prescriptions, he called for “something big” and “something early,” rather than waiting for even more debt to build up. “Having some sort of plan I think would be a good signal,” Hall said. Womack said lawmakers should focus on mandatory spending, which is projected to hit 15.1 percent of the country’s gross domestic product in fiscal 2028. He said Democrats seem to be focused entirely on raising revenue. Republicans also noted that the CBO report anticipates a slight dip in economic growth toward the end of its 10-year projection, which Hall said is when some of the tax cuts are set to expire. That’s evidence that a tax increase aimed at undoing the Republican law would hurt economic growth, Rep. Jason Smith (R-Mo.) said. The post Corporate Tax Hike Likely Part of Democrats’ Budget Blueprint appeared first on Bloomberg Government.